Windows Server 2012 R2 is supported only with Exchange 2013 SP1 or later. Windows Server 2012 R2 forest functionality mode is supported only with Exchange 2013 SP1 or later. To ensure that every Exchange client access mail securely from anywhere (internally and externally) Exchange deployment published through Forefront TMG 2010. you need to plan and deploy the different roles of Exchange Server which includes Exchange HT, CAS, ET and Mailbox and publish in Forefront TMG 2010. The main purpose of these deployment is to improve performance for client access, secure client access and encourage utilization of best practices of Exchange, TMG, and the Exchange clients (Microsoft Outlook) involved. 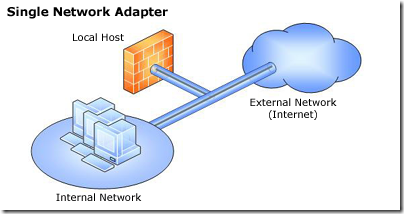 There are few consideration you must take into account such as placing of server in different network segments. Create proper policies in TMG to allow https, POP3, IMAP, SMTP traffic securely to Microsoft Mail clients. 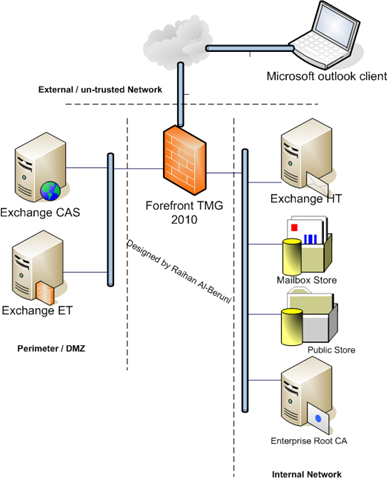 In the following figure, I have illustrated a typical Exchange 2010 design that include Forefront TMG 2010.
their mailboxes, or they can use RPC over HTTP over the Internet to check e-mail via Microsoft Outlook. Of course users with mobile devices capable of ActiveSync can access their mailboxes using Exchange Active Sync (EAS). When the administrator has decided which client access methods need to be made available, access to certain folders needs to be allowed through TMG. This is done via the Exchange Publishing Wizard, which is discussed in the next section. the default paths configured after running the New Exchange Publishing Wizard. forward the request using Secure HTTP (HTTPS), TMG initiates a new SSL connection with the published server. Because TMG is now an SSL client, it requires the published Web server to respond with a server-side certificate. of an authentication mismatch, client access fails and a credential delegation alert is logged by TMG. synchronization is complete, intermittent connections occur, in which new messages are transferred. The Outlook client would, however, maintain about 10 connections with TMG after it is connected. For a user utilizing Outlook heavily, the synchronization operation transfers many bytes of data over a small number of connections, so the overall characteristic bits per connection value is rather high (such as 500 kilobits per connection). Also known as RPC over HTTP, this traffic profile is the noisiest of all Exchange clients. It imposes a combination of high connection count (can be 20 or more separate TCP connections) with a higher data rate also coincident with the user activity. This traffic profile is the lightest client of all, with only one TCP connection and very light traffic flow. A new HTTP connection is only made when a user performs an operation such as Open, Send, or Move To Folder.